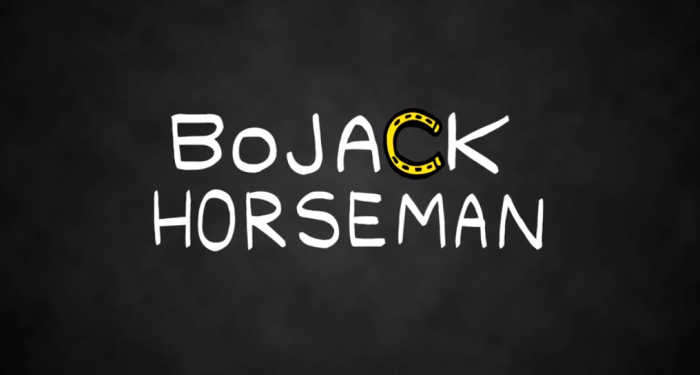 On Friday the internet-streaming service Netflix released their newest original series, "BoJack Horseman". I kind of broke my rule against binge-watching because as of today I was able to digest all 12 episodes. I saw some mixed reviews of the series but enough people have already enjoyed the 1st season enough that it has been renewed for another one. As for how I felt about BoJack? I thought it was great. "BoJack" focuses on its titular character, a washed-up 90's sitcom star desperate for a comeback. With the help of a ghost-writer named Diane he might have a chance, but "friends" like Mr. Peanutbutter (a golden lab) who also had his own sitcom or house-mate Todd (a friend BoJack met at a house-party who never left) might derail those plans. 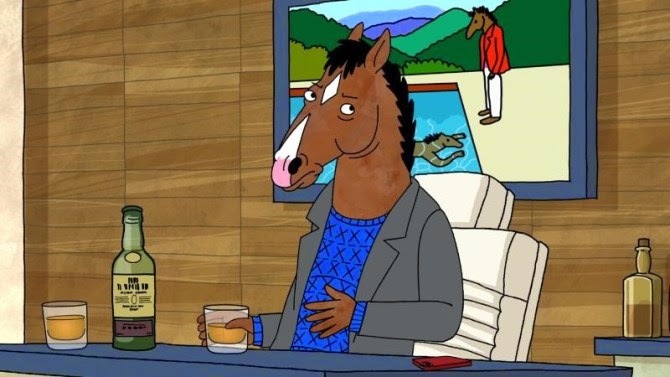 Various people from the past come into the picture along with new folk and half the time we want BoJack to succeed and other times we think it might be better if he fails. "BoJack Horseman" starts out with the early episodes having a bit of an absurd feel almost like the early episodes of "Aqua Teen Hunger Force" or the other quirky Adult Swim programs from some years ago. Perhaps I felt that way with the mixture of humans and anthropomorphic animals (who aren't given a reason for existing, but just sort of are people in this world), as that really gives everything a slightly surreal feel. It works though as the animal-people look different but not too jarringly separate from normal humans. Much of the credit for that goes to the talented Lisa Hanawalt (someone whose work I'm a fan of) who designed the characters expertly. Now, the early episodes are quirky and silly, but then something interesting happens as the season proceeds, namely things get darker and a bit more serious. I like that "BoJack" does this as we actually see some character growth. BoJack is clearly unhappy, but as we slowly learn why, BoJack becomes...not necessarily someone we have sympathy for, but someone we understand. "Bojack Horseman" does a solid job mixing the serious with the silly, and I would give Will Arnett a good deal of props for it. Having played characters that are often lovable heels (see Gob on "Arrested Development") he brings just the right amount of being smug and a jerk yet caring and clearly desperate to be liked. Other cast-members such as Amy Sedaris as Bojack's agent and girlfriend (whom is also a cat) turn in wonderful performances also. With the mixture of solid animation and great voice-acting it makes everything work wonderfully. Netflix has been producing some quality shows lately, and shows little sign of slowing down. As time goes on and more people use DVR or internet-streaming television as we know it appears to be shifting radically in its design. "BoJack" is another quality program spearheading this change to internet-television and binge-watching, with many more to follow. I greatly enjoyed watching "BoJack Horseman" and if you have Netflix you should give it a look too.